When most people think of hardwood flooring, they imagine simple wood floors in various shades. It’s a firm, warm material that invites you into the home. In reality,hardwood flooring is far more complex. There are two different types of wood flooring: engineered and solid wood flooring. Which one will you choose? It’s not an easy decision for most homeowners. First, let’s explore solid hardwood. Solid hardwood flooring is a single piece of hardwood. There are no additional materials mixed into the flooring solution. It’s just wood. Then, you have engineered wood flooring. It’s a more cost-effective option with some key differences. Let’s break down engineered wood flooring to understand what all the craze is about. It’s important to note that engineered wood flooring is actually a layered product. The first layer is a thin slice of hardwood on top of high-quality plywood. The overall thickness can range from 3/8-inch to ½-inch. The standard width is 3 ¼-inch. Most engineered wood flooring comes pre-finished, which can save you time and money during the installation process. 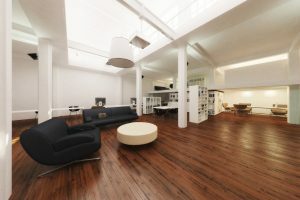 Some manufacturers do design engineered wood flooring that is site-finished. It’s an additional step in the process that can have dramatic results. Perhaps the biggest difference between engineered and solid wood flooring, besides the material used, comes from the sanding process. With engineered wood, you can only sand the material once or twice – very lightly – or you risk wearing away the thin upper layer. The same cannot be said about solid wood flooring. Engineered wood flooring is durable, provides high performance, and has minor cleaning requirements. Engineered wood flooring is made of multiple layers of wood. Every layer is positioned in a different manner to prevent warping and bowing like solid hardwood flooring might in a moist environment. The biggest advantage that engineered hardwood has over regular hardwood flooring is that it can be installed in most homes types and varying grade levels. Even a home that is below ground can have engineered wood with an added vapor barrier. The hardwood veneer provides an elegant appearance to the entire room. If you are torn between engineered hardwood flooring and solid wood flooring, we hope we have provided a better understanding of the two. Your decision should now be a little easier. If you still need more advice, don’t hesitate to reach out. Call Starwood Distributors for all your hardwood flooring needs at 214-718-7304! jtseoconsulting has contributed 2 entries to our website, so far. View entries by jtseoconsulting.